With new leadership and a new location, Community Education is restructuring the classes offered districtwide, responding to industry and community feedback. Community Education Director Susan Sweeney, who stepped into the new role April 2017, channeled two decades of working with industry and social service agencies. She brought a broadly sketched outline of community education priorities into focus. In the process, traditional leisure classes, which were no longer filling, have been replaced with skills-based, career-building opportunities demanded by industry, employees and residents alike. Water Resources Management, now an established program, has served as an incubation model. Begun as community ed classes several years ago, the program gained popularity as the drought worsened and long term water industry employees began to retire. From a few classes, the program grew to a certificate, degree and transfer degree Career Education program to four-year colleges. She noted a welding class taught at Christopher High School in Gilroy. The trade skills class caught on quickly, always filled and shifted from an enrichment class to a skills class. “Industry said ‘we need this, our employees and future employees need this,’” said Sweeney. Listening to industry, she discovered employees could’t read blueprints, make adjustments, understand symbols. Those skill sets have been added to curriculum. Community education staff did an audit of available classes, noting which were not filling. Sweeney convened focus groups, as well as a consortium of high school representatives and a number of industry leaders. Based on input, new programs now in the incubation pipe line include Phlebotomy, Pharmacy Tech and Vet Assistant. techniques to pass the class and the state exam. 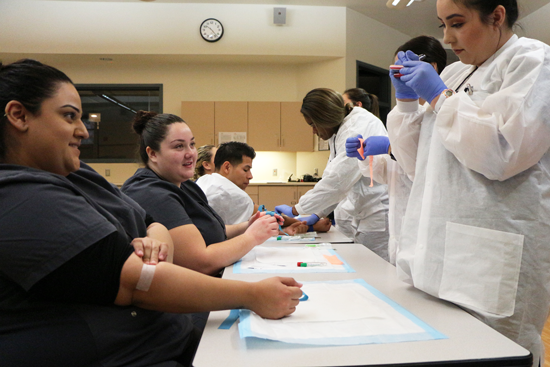 The Certified Phlebotomist training program combines 65 hours of classroom instruction with a 40-80 hour externship. Classes are held on Saturdays, and externships are scheduled according to the partnering labs’ hours. The class has been held four consecutive terms, and it always fills with a lengthy waiting list. 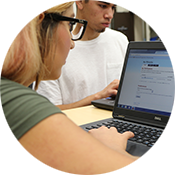 Students also prepare for the California State Exam, so successful students can apply for Laboratory Field Services CPT-1. Students do not need to have a background in health education to take the class and become licensed in the practice. Area phlebotomist salaries range from $18-22 per hour. 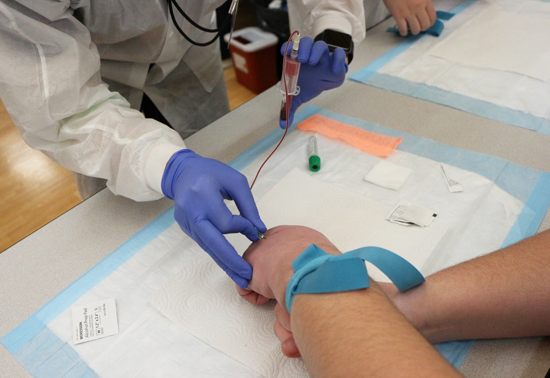 A student in the Certified Phlebotomist training program draws blood from the hand. 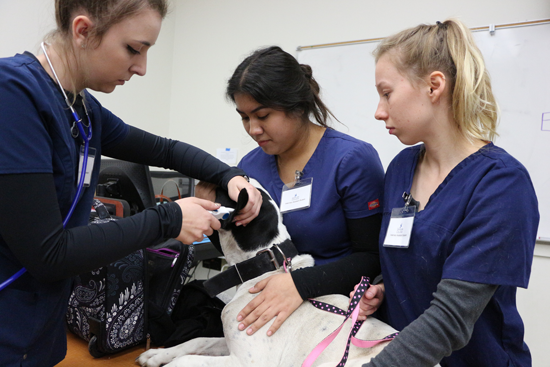 Veterinary Assistant classes, which just concluded the second consecutive term, train in all the components to support animal care under the direction of a veterinarian. Classes meet for 70 hours, followed by a 40-hour externship. Area vet assistant salaries range from $13-19 per hour. practice delivering injections to muscle and to skin. “Local vets are very excited about this program,” said Sweeney. Students learn to handle animals, deal with sick animals, prep them for surgery, and care for them while receiving treatment at the vet’s office. It is a serious occupation, and the classes prepare students for the reality of the work. temperature using an ear thermometer. 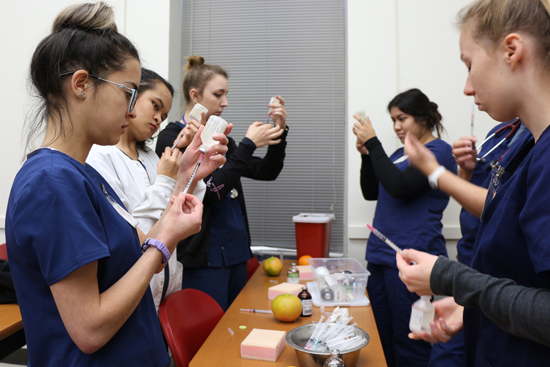 Pharmacy Technician, a new class that started Fall 2018, trains students to fill patient prescriptions to doctor’s orders. Classes meet for 144 hours, accompanied by 120 hours of externship work. The training prepares students who complete the class to take the Pharmacy Technician Certification Board exam. Area Pharmacy Tech salaries range from $16-20 per hour. 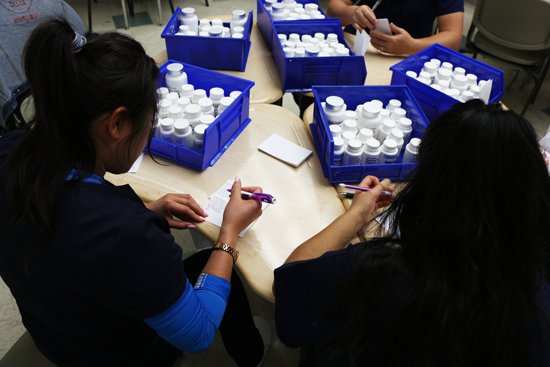 Students in the Pharmacy Technician class sort, catalog and inventory a new shipment. New ideas for community education classes are processed through a decision tree Sweeney developed in cooperation with Career Education, which offers certificate, degree and transfer degrees in multiple areas of study, as well as with noncredit programs that offer basic skills education. In addition to all of the above classes, Community Education partners with industry to offer classes tailored to their employees. TEKnova, a microbiology firm in Hollister, was one of Gavilan’s first partnerships. Through Community Education, the college offers a manager boot camp at the company’s facilities. Chamberlain’s Children Center, a San Benito County residence facility and school for at-risk children, reached out for training after the state changed the work requirements for employees. Gavilan developed a program with 20-40 hours of outside training so the current employees could meet the new requirements. “We invite industry to the table,” said Sweeney. 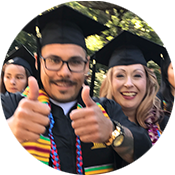 “They can specify the training skills they are looking for.” Gavilan College Community Education can locate the facilities, instructors, build the curriculum and deliver the training and education. Contact Susan Sweeney by email or phone (408) 229-4206.